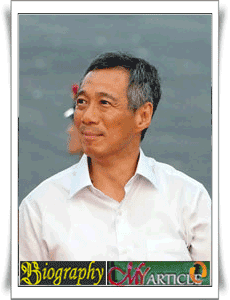 Lee Hsien Loong was born in Singapore, 10 February 1952, who served as the third Prime Minister of Singapore and Singapore Finance Minister. His father was the first Prime Minister of Singapore, Lee Kuan Yew. Status as the son of Singapore's first Prime Minister, raises suspicions by nepotism. not to mention the community was shocked with the lifting of Lee's wife, Ho Ching, as Director of the STATE-OWNED ENTERPRISES. Lee Hsien Loong has joined the Singapore armed forces in 1971 after graduating from the University of Cambridge and Harvard. After occupying a position in the armed forces of Singapore Bridgen, 1984 he resigned as elected members of Parliament. During the two years of his term as a member of Parliament, Lee then switch positions as the Central Executive Committee of the people's action party along with his position as Deputy Prime Minister in the 1990 's. January 1998, Lee returned to his political wings that expand to have new post as Chairman of the monetary authority of Singapore. The three-year tenure as Chairman of the monetary authority of Singapore, Lee replaced Goh Chok Tong's position as Prime Minister of Singapore on August 24, 2004. His position as Prime Minister of Singapore is decorated with some of the rumors. Lee's Government was considered arrogant and autokrasi in addition to the allegations of nepotism in Government.